How much is a pachinko machine worth? Welcome to Pachinko Man an subsidiary of Pachinko Restorations! This web site was setup to provided free information on and about pachinko machines from Japan. We have other web pages setup for the sale and restoration of vintage pachinko machines, so if you could also visit them for pachinko service. Here is a little background history on the machines. Pachinko has been played all over the Orient ever since 1947 when it was originally designed to be a diversionary or entertaining game for the Japanese. Since 1947, the game has taken on many different uses for play. A pachinko machine resembles a vertical pinball machine, but with no flippers and a large number of relatively small balls. The player fires a ball up into the machine, controlling only its initial speed. The ball then cascades down through a dense forest of pins, and in most cases, the ball falls to the bottom and is lost. However, if it instead goes into certain pockets, more balls are released as a jackpot. The object of the game is to capture as many balls as possible. These balls can then be exchanged for prizes. Just after World War II, pachinko was played by many Japanese war refugees and the prizes were part of a subsidization program for them almost as a food stamp program subsidizes the needy. The bigger the winner, the more commodity goods one could get. This way, the Japanese pride was not tarnished by accepting charity. The Japanese society frowned upon accepting any form of charity. But by playing pachinko, they felt that they had been personally responsible for earning their own food. The players would take the balls and redeem them for either food items of coupons worth so much toward the purchase of food. After Japan made her speedy recovery from the ravages of war, the game took on another characteristic for play. 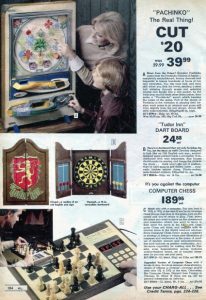 It was played much the same as games found on the American carnival midway. 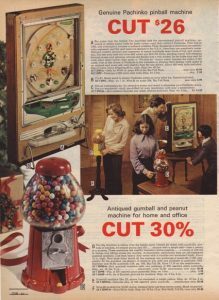 Pachinko was played just for fun and the most popular prizes were American cigarettes and other cherished imported items. In the early 1960’s the Japanese pachinko parlors became much closer to true gambling casinos. The game was played not only for prizes, but for money. However, because of underground connections, the game was accused of being fixed. Many Japanese were losing their entire weekly paychecks by playing pachinko, whereas, before, they were winning enough to support themselves. In the late 1960’s the Japanese government stepped in and prohibited the pachinko parlors from paying off in money. This significantly reduced the undergrounds interest in the operation of pachinko parlors. This meant that the pachinko parlors reverted back to the way they had operated in the 1950’s. Today, the pachinko parlors are actually family entertainment centers with bright lights and lively colors. The whole family plays pachinko several hours a week. The parlors look very much the same as American bowling alley entertainment centers and penny arcades. When Pachinko Parlors decommissioned the machines after about a year of use, they were sold cheap to make room for newer models. Servicemen and businessmen started to bring them back in the late 1940’s. 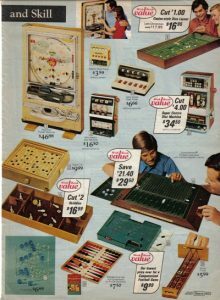 There were hundreds of thousands of pachinko machines imported in the 1960’s and 1970’s, and sold by Sears, Montgomery Wards, Target Abroad, Woolworth, Pachinko Palace, Spiegel, Pachinko Imports, The Pachinko Factory, Sutra Import, Kmart, Meshulam’s, Pier 1 imports, and others. The newer pachinko machines are still imported today and sold around the county and online. 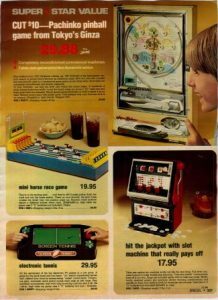 When home video games became popular, or when enough of the balls were lost making the game unplayable, the pachinko machines were put into storage and forgotten.